Greenacres Bed & Breakfast, is a renovated old farmhouse, with a working smallholding of 12 acres situated in Marshwood, near Bridport, Dorset. We also have a family-friendly, self-catering, converted railway wagon which sleeps up to 2 adults and 2 children. In the land surrounding our B&B we keep sheep, lambs, pigs, ducks and hens. This means that you can enjoy our own 'home grown' bacon, sausages, and freshly laid eggs for your breakfast. Don't worry - we also cater for non meat eaters as well! Our B&B is surrounded by beautiful hills and wildlife and we are only a few miles from the world heritage Jurassic Coastline, with lovely walks over Golden Cap. 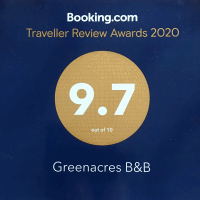 If you are looking for a farmhouse B&B in the Bridport, Dorset area, Greenacres is in a great location for exploring the Dorset coast. 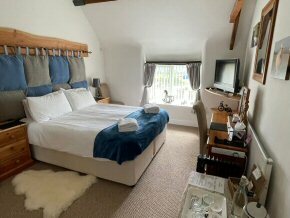 We have two bedrooms open to our guests, plus self catering accommodation in our own unique railway wagon. 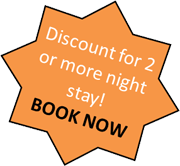 Find out more about our accommodation and the comfortable rooms we have to offer. View the gallery, showing photos of our smallholding, animals and local scenery. Book your stay with us today either online via booking.com or by calling us. Find out about local things to do in the beautiful area in which we are situated. Enjoy a wonderful stay in our B&B near Bridport Dorset. We have a double / twin room called 'The Paddock' where two single beds become one double bed. There's also a second double room called 'The Meadow'. In addition to our farmhouse B&B rooms we have a separate converted self-catering railway wagon suitable for families. 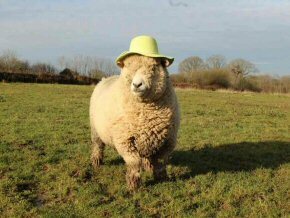 Our Dorset B&B is a renovated old farmhouse, and we keep sheep, lambs, pigs, ducks and hens. You can enjoy freshly made breakfasts made with our own produce. 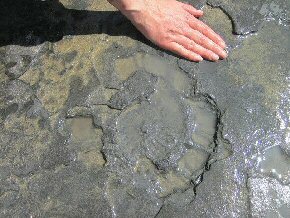 Our bed and breakfast accommodation is a short journey from the famous Jurassic coast, with its spectacular scenery, coastal towns and villages, and fossil collecting sites. We are an excellent choice for a B&B near the Dorset Coast.